Last evening, I fished the Lamprey River at Wiswall Dam in Durham to try to get on an evening hatch. I briefly went there last week and saw a nice fish rise but didn't stick around long enough or take any casts since it was dark by the time I got there. The flows were great but the water temps felt to be in the mid 60's, which is in the upper ideal range of tolerance for trout species. I would have to time this right and I did. When I got to my spot, I was greeted by an overflowing parking area. For one second, the thought occurred that they stocked recently but looking ahead at the bridge, it soon became clear that summer had began and the cars belonged to recreation bathers and teenagers. Just to be certain, I decided to cross the bridge and glance downstream for evidence of other fishermen before making any decisions to fish. As I was driving across the bridge, some teenagers were standing in the middle of the road absolutely oblivious to the moving car heading towards them. One even stared me down with the most insolent stare I've ever seen when I drove towards him almost to say that was his road and I had no right (with my car) to be there! Call me old but I think that the high schoolers of today (just a few years younger than me) are sniveling, little entitled brats who lack the brain capacity of a weaning infant. But, I digress.... After that setback, I found some parking and took a walk down to the river. I immediately started nymphing at the powerline pool and got a fallfish and a decent brookie right off the bat. I continued towards the deepest hole in the pool and immediately had a nice fish hit my indicator. Not wanting to go through that whole routine, I decided to switch to a streamer with a soft hackle dropper. After a few casts, I caught bottom so I decided to switch up to swinging a BH soft hackle. After a number of casts, I got hit as I was stripping the fly back at the end of the swing but it didn't stick. The very next cast, I got hit again, this time on the swing and it stuck. A nice brown gave me the fight of my life, jumping a grand total of 5 times before ultimately popping off. It was at that moment I felt a mix of anguish and joy. Anguish that this would be just another fishing story but joy that I got to experience the take and the thrill of a nice fish that gave me all it had and more. After that, I could not repeat my success for quite some time as I continued working downstream for a good ways with no more takes on the soft hackle. Once I returned to nymphing, I got a fallfish at a pool further downstream but no trout, though I did see one rise once on the opposite shoreline. I decided not to trek out for that fish since it didn't come up again and since I didn't see any bugs really coming off the water so I worked my way back upstream instead. I decided to start Czech nymphing in the fast water at the head of the powerline pool where I lost the brown in the hopes that more fish were buried deep in the current but all I got was a pumpkinseed to show for my efforts. Luckily, I did spot two fish rising at the tail out, one of which was splashy and aggressive so on went the soft hackle again. Before taking any casts at either fish, I made sure to get into a good casting position from which I would be able to present the fly without spooking them. Several casts later, I felt the familiar tug but I lost it on the hook set. I threw a few more casts from that original position without any further attention so I decided to shift a few feet and work the seam where I saw the other fish rise and within a few casts, I felt another tug and this one stuck! I soon pulled in a gorgeous brookie. I took a few more casts and caught a couple pumpkinseeds and a largemouth bass before calling it a day. 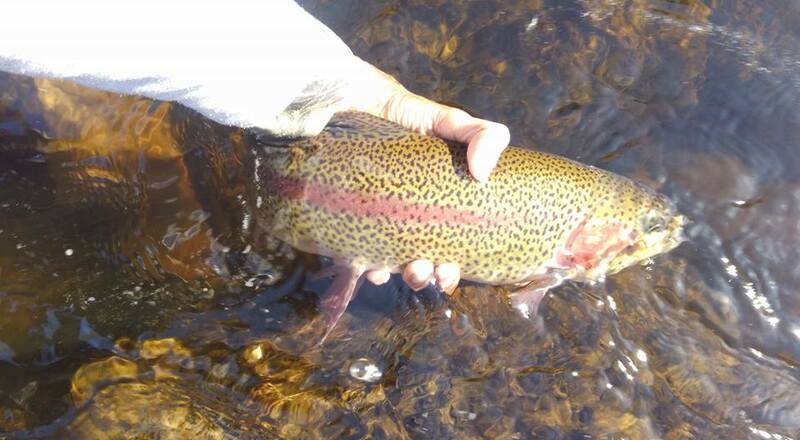 All in all, I had a great time on the water although no hatch really materialized but it felt awesome to be catching trout this late into the season after the dismal drought of 2016.